The City of Lewisville invites residents to meet the artists of its latest public art pieces on Wednesday, Jan. 16, 11 a.m., and 7 p.m., in the Art Gallery of Medical City Lewisville Grand Theater, 100 N. Charles Street. You are invited to the Opening Reception for Merging Visions 2018: A Collaborative Exhibit of Art and Poetry on Sunday, October 21, from 2-4 pm at the Medical City Lewisville Grand Theater, 100 N Charles St, Lewisville, TX. Experiment With an Airpump from October 12th through the 28th. You are invited to the Opening Reception for Merging Visions 2018: A Collaborative Exhibit of Art and Poetry on Sunday, October 21, from 2-4 pm at the Medical City Lewisville Grand Theater (100 North Charles Street, Lewisville, TX 75057). Wild & Free is the final show for the Visual Art League of Lewisville for 2018. This is a VAL Gallery members show and is judged by Barbara J. Mason. Avant-garde art and a surprise art installation. The Visual Art League of Lewisville in conjunction with the Greater Lewisville Community Theater are exhibiting artwork in the lobby during the coming play, Welcome to Arroyo’s. Exhibitors are, Tina Alvarez, Darla Bostick, Elaine Gary, Sabra Schray, Ruthe Smith, and Patty Rogers. 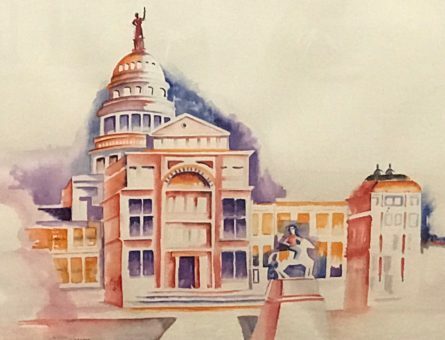 The Visual Art League of Lewisville will present their new exhibit, Fresh Ideas 2018 at the Main Gallery of the MCLGrand Theater, 100 N. Charles St, in Lewisville. This is a juried show, with monetary awards and the first place winner is eligible for a one person show the following year. June 23 – July 28 Black & White Show (VAL members only) Art must be black and white, no sepia tones. The Visual Art League of Lewisville presents Lucy Tolkunova on drawing at 7pm on Feb. 13. Location: MCL Grand theater at 100 Charles Street in Oldtown Lewisville at 7 pm. The public is welcome to attend. Millie Giles will talk about the jurying process for winning entry in art competitions. This program is open to the public and there is no charge. 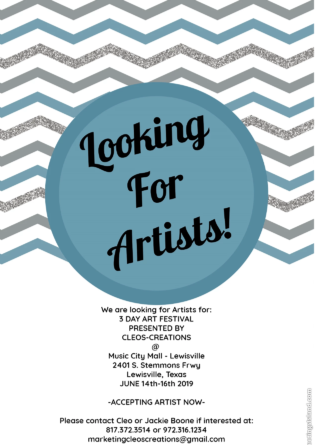 Visual Art League of Lewisville artists will be exhibiting artwork in the hallway of the MCL Grand Theatre, 100 N. Charles St., Lewisville, on September 17th during the Lewisville Lake Symphony performance. The performance is on September 15th at 7:30 P.M.